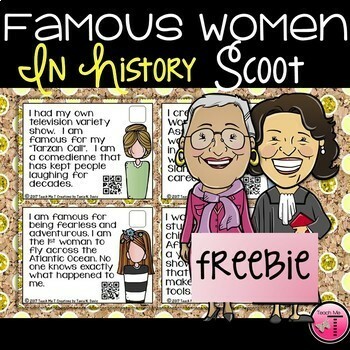 The Famous Women in History Scoot FREEBIE activity consists of 6 task cards. Each card features a clue, or description, of a famous woman in American history. Students can use their prior knowledge about these amazing women, or use this as an opportunity to conduct research about their contributions to US History. With this resource, students will have the opportunity to learn about famous women that paved the way for others (Trailblazers), and about women that are making history today (Living Legends)! Don't reserve the contributions of women for the month of March. Share the achievements of these (and other) amazing women every day! Note: I have not placed numbers on the task cards so that you may add them to the Famous Women in History Scoot or Task Cards with QR Codes. There is a space where numbers can be written. Women in history-inspired facts + task cards + a challenge + moving around the classroom = an amazing day of learning! 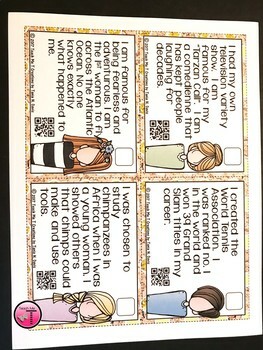 •To supplement/add more task cards to the Famous Women in History Scoot Set that you already own. 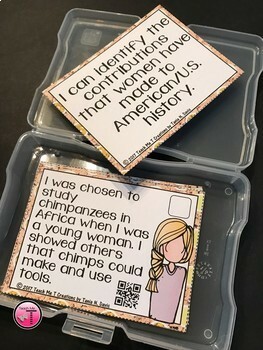 To purchase the complete Famous Women in History With QR Codes Scoot activity, click on this link Famous Women in History Scoot This will give you 24 additional task cards. Should you have any questions or suggestions, please don't hesitate to contact me. I love receiving your feedback! If you find this activity to be beneficial to your students, please return to the product listing and leave feedback for me. This will help me to know how you/your students enjoyed this product. It is also a great way for you to earn TpT credits towards the purchase of additional products from my store or from other Sellers.